Musical notes on a staff are grouped in measures, or also called bars (I will use both terms in this lesson). How many beats in a bar there are? Well, that depends on the time signature, as we will see soon. How many beats in a bar (or measure)? You can often hear musicians that play together count 1 – 2 – 3 – 4 before the song starts. What they are counting, are actually the beats in a measure. Most songs have 4 beats in a bar. 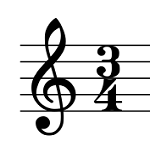 You can count 1 – 2 – 3 – 4 – 1 – 2 – 3 – 4 – … during the whole song (when the time signature doesn’t change during the song). Another common type of songs has 3 beats in a measure. A waltz is an example of a piece with 3 beats per measure. Those two types (4 beats in a bar and 3 beats in a bar) are most common, but other numbers of beats in a bar are also possible. Let’s again have a look at songs that have 4 beats in a measure. You remember probably that a quarter note has a duration of exactly one beat. So that means that instead of saying 4 beats per measure, you could also say: 4 quarter notes per measure. A piece of music that has 4 quarter notes per measure is called a piece in 4 quarter time. Or, you can also say: the time signature is 4 quarter. Now, 4 quarter notes per bar doesn’t mean that you can only have quarter notes. It means that all the note durations of the notes in one bar added together make 4 beats. For example, 1 bar can consist of one whole note, or 2 half notes, or a half note with 2 quarter notes. One bar can have 8 eighth notes, or 4 eighth notes and 2 quarter notes, etcetera, as long as the total duration is that of 4 beats. Let me give an example of 4 quarter time music. In the next staff, 2 bars of a little musical line are written out. Note that the bars are separated by vertical lines. For a good understanding of the music, it’s important to know on which beat the notes in a song are. To know this, you can count 1 – 2 – 3 – 4 – 1 – 2 – 3 – 4 etcetera during the whole song. In the next sound sample, you will hear the musical line written in the staff above. The metronome will count to 4 before the song starts. Count 1 – 2 – 3 – 4 – 1 – 2 – 3 – 4 – 1 – 2 – 3 – 4 with the metronome and pay attention which notes in the staff are exactly on beat 1, beat 2, etcetera. We already know how many beats in a bar the 3 quarter time signature has: that’s 3 beats, or 3 quarter notes. But any other combination of note lengths can be made that add up to 3 quarter notes, of course. So, 1 quarter note plus 4 eighth notes, or 2 quarter notes and 2 eighth notes, etcetera. You might notice a strange thing: the first measure only has 1 quarter note, when it should be 3! This happens quite often in the beginning of a song: the song actually starts on beat 3 instead of on beat 1. We call this first measure with only one quarter note a pickup, or more oficially, an anacrusis. Below, you can listen to a sound sample of the first line of Amazing grace. The metronome begins by counting to 3 (because it’s 3 quarter time), then it starts again to 3. The pickup note (the G) is then played on beat 3. So, this means that you will hear the metronome count 5 times before the first note plays. There are many other time signatures, sometimes very exotic ones, like for example 11 eighth. I will not talk about those very complicated time signatures, but let me introduce you 2 more or less common ones. In a 6 eighth time signature, you can have 6 eighth notes per bar. How many beats in a bar is that? Well, that’s 6 beats, because every beat in a 6 eighth time signature goes with an eighth note. Now, this might be confusing for you, because in my lesson about note durations I told that a quarter note was exactly one beat… Well, this is true for all the ‘quarter time signatures’, like 3 quarter and 4 quarter. In ‘eighth time signatures’ (like 3 eighth or 6 eighth), every eighth note is exactly one beat. In fact, the ‘8’ in 6 eighth means that every beat corresponds to an eighth note. The ‘6’ in a 6 eighth time means that you have 6 of those eighth notes in a measure. You might ask: “What’s the difference between 3 quarter and 6 eighth? You could very well have 6 eighth notes in a 3 quarter time piece! The difference is: which beats are accentuated? When you have 6 eighth notes in a 3 quarter time piece, you actually have 3 times 2 eighth notes. You could count like: ‘1 and 2 and 3 and’ for the 6 notes. The accents are on beat 1, 2 and 3. When you have 6 eighth notes in a 6 eighth time piece, beats 1 and 4 are accentuated, so there are 2 groups of 3 eighth notes in a bar. You can then count as follows: ‘1 – 2 – 3 – 4 – 5 – 6′. One of the most famous pieces in 5 quarter time is “Take five” by Dave Brubeck. How many beats in a bar has a piece in 5 quarter time? Well, 5 of course: 5 quarter notes. I hope this lesson helped you to learn about bars and beats. Please tell us what you think of it in the comments below. Martin Cohen is a science and piano teacher. He is also a jazz musician and composer.